For the past two weeks, we've talked about truescale models. 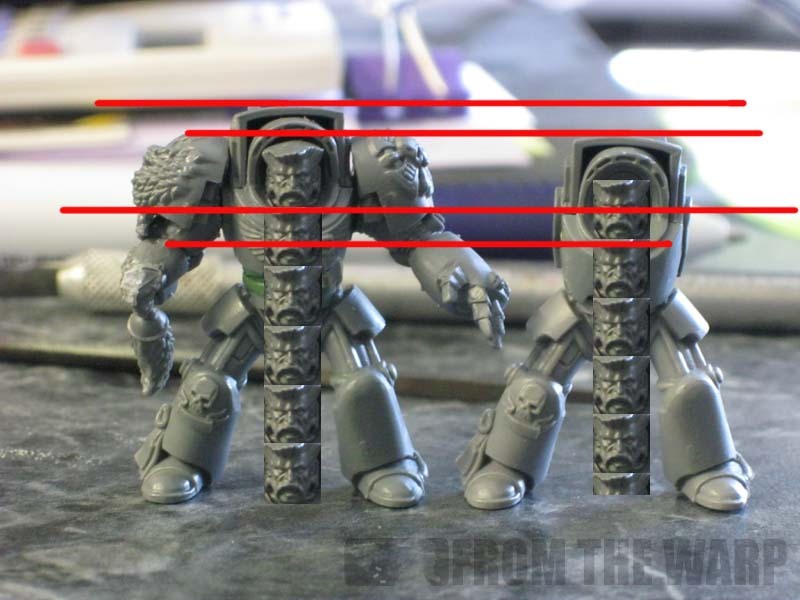 We've covered some of my thoughts, a look at one of the third party products out there and today we're going to look at a few size comparisons along with my suggestions for truescaling terminators. One of the first things I thought of when I started down the truescale road was how would it affect the other models in my army. Lots of folks think about how their models will tower over their opponents force, but forget the same thing is going to happen in their own army as well. And we won't even consider whether on not we like or agree with this version of a truescale terminator. Let's look at him purely from a height standpoint compared to the other models. You can see the difference in heights between the few models I lined up here. While they aren't that big of a deal, a terminator is already a bit bigger and bulkier than a regular Eldar model. Make the leap to truescale proportions and everything becomes much smaller across the board. 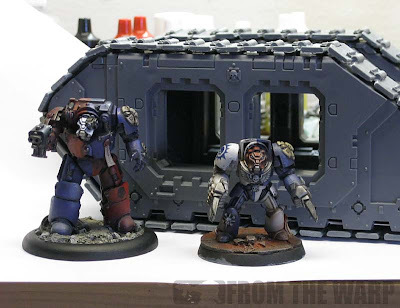 Here we have a pair of terminators compared to a dreadnought. 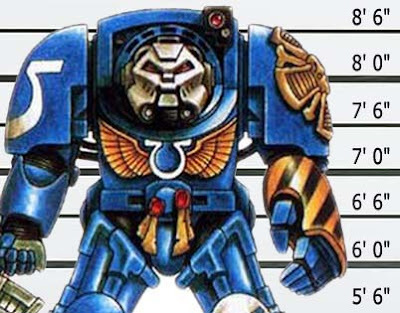 I've always imagined dreadnoughts being a good bit bigger than even terminators are. Jump up to truescale and your dreadnought is not so big and mighty now. Even the mighty Land Raider takes a hit and looks more like a Rhino when you move up in sizes. I can't even begin to imagine what you have to do to truescale a dreadnought or Land Raider so they fit in with the look of your troops. I'm not saying it wouldn't look absolutely stunning on the tabletop, it's just going to be a massive undertaking. So what's my grand idea then? My idea is not anywhere near as involved, but still requires a bit of work. It appears nothing is simple or easy when it comes to this kind of thing. There are two things I like to change. First is the abdominal section and extending it slightly to increase the overall height of the model. Not much, just a bit to make him look as though he's standing upright and not hunched over. This is done by adding a spacer between the two sections of the model. I've started greeenstuffing some armour plates to fill in the space, but I still have some work to do in that department. It needs to be bulky enough to look "correct" and I'm not there yet. I like to think I could make it into something I could make a mold of and then cast so that I could add this non-descript abdominal spacer in there when building my terminators and make the process as smooth and painless as possible. The second thing is relocating the arms on the side of the torso. 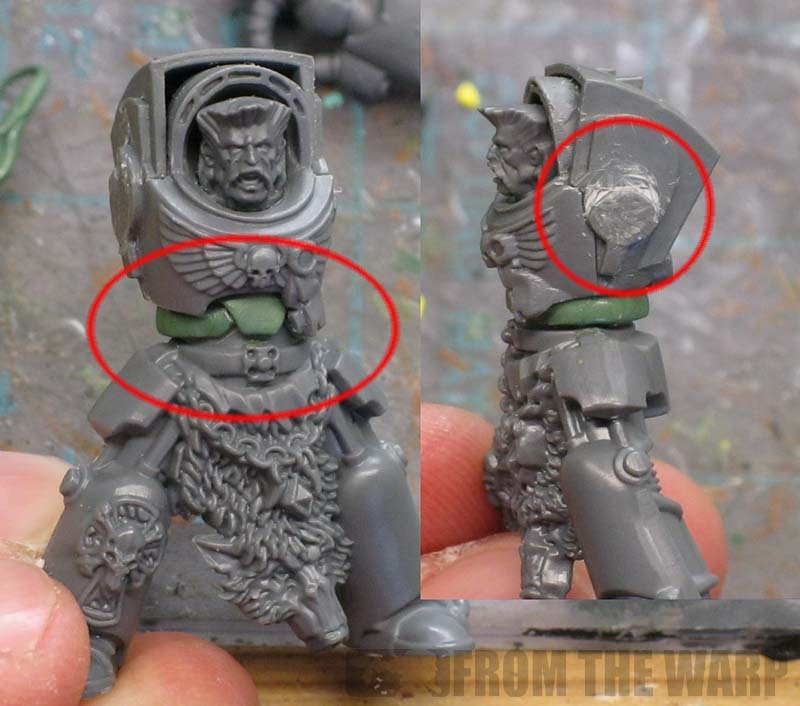 This is an easy fix and requires a tiny bit of cutting away at the arm peg on the sides of the torso. Just enough to lower them down slightly so it looks as though his arms are coming out of his torso and his head sits on top of his shoulders instead of in front and level with them. I cut away about the top 1/3 of the arm peg. That combined with the extending of the abdomen section seems to make enough of a difference for my tastes. It's a minor thing, but once you find something like this that you want to fix (and it could be anything on a model) you need to fix it otherwise it will draw your attention for ever. Here you can see my changes compared to a unaltered terminator. Not that big of a change really. Seeing the model front on like this shows that the abdominal section still needs some bulking out. That could be done by actually building it up or covering it with other items like a tabard and cloak. Add a few items to his belt and all of a sudden you don't even notice it. You get the added height without having to make it work. In the end, it only adds an extra 1/2 head height to him overall. He's still out of proportion I'm sure. But... it does make him look "correct" to me. When I look at him now he's not hunched over, his arms look like they're in the right place and he's standing upright. That's the biggest thing of all with this whole idea of truescale. Making your models look "right" to you. I mean that's the whole reason for an undertaking of this size and scope anyway isn't it? You don't like the way they look as they are. If you like the look of your models, that's all that matters. Truescaling is something that will fix certain issues and create other issues at the very same time. Ultimately you have to decide which issues bother you and which ones don't. If you can find that balance and a solution, you'll be set. As for me, I think I'm close. This is a really interesting and well balanced approach. I've never been that bothered with the scale of models, so re-scaling (truescaling) was never a consideration. Although I'm not sure it will be even after this series of articles, you have greatly enhanced the way I look at my models, for which I've very grateful. Cheers. Very nicely presented Ron, and I'm really liking how you are doing your own true-scaling, its looking really "right". That after-market kit looks absolutely huge, really gets the idea of Tactical Dreadnought armour though, its pretty much the size of that regular dreadnought. A way to approach distances in 40k is to think in terms of a logarithmic scale. That would explain weapon ranges or units movement distances for example. When applied to individual models, it means that the difference in heights between the PA marine and the eldar in the picture above is smaller than the difference between the PA and TDA in the same picture, even if they seem roughly the same. Maths nerding aside I am looking forward to see finished that Wolf Guard TDA and how it looks in relation to a PA model. This is a easy and simpel solution to let the termie look better. Great stuff! This is for everyone doable even if you're not that great with green stuff. Thx good solution. In my opinion, GW makes basically ALL their Space Marine kits the appropriate size...it's mostly their other models that are too small! Very cool Ron. I think adding the spacer in between his torso and legs looks the best to me. I'm currently working on doing the same, but also to update my metal terminators to the newer size. I should have some pictures soon on my blog too, once my order of green-stuff comes in. Hi Ron, that is a very cool and quick way to scale those bad boys up. I like it a lot.I found this tutorial today over on death squads site on how to true scale a regular marine so thought id share with you after reading your article. The `true scale` always baffled me. How do you put something in a true scale when the admitted scale, i believe 40k is heroic 30mm, isn't an actuale scale modelling. That said, I do like the look of bulking up some models, like terminators and dreadnoughts. This project is coming along quite nicely. Davey: I've gone since Rogue Trader and it's never been an issue for me really. Glad to hear the series gave you something to think about. Andy - bG: That's what I thought. That guy is the size of a dreadnought. Ettiene de Coning: Good luck! I hope you're able to find something that doesn't create a ton of work for you. Albert: The issue of ranges (for weapons) has always been around as well. That's something that gets some folks stirred up as well. D.W.G. Wals: I don't know about that. I thought it would be easy and simple as well. Maybe I'm just being nit-picky with the looks at this point. I think once you get into this kind of thing, it opens up all kinds of small issues you need to deal with. The Stone that the Builder Refused: You have to admit, they do seem to have a plan and scale things according to their measurements across the board. Aaron Harris: I'd love to see what you come up with. Please send me some pics! chet manly: Out of control. I run two land raiders in my force. I don;t know if I could afford to truescale my whole army. james fenton: Excellent, thanks for sharing the link! Xzandrate: A good question Sir. It comes down to looks I suspect in the end. I wouldn't really call actual marines in scale at all, even with them selves, you think about how thick their hand wavium armour would be on their thighs, then imagine how skinny their leg must be to fit in that, same goes with the terminator (normal) pictured above next to the eldar, the eldars spandex-esque bodysuit would be quite close to their thigh thickness, then look across to the termy, imagine the support struts aren't there, his thigh is just as thin as the skinny non muscled eldar's. As a general rule I use guard as my base to figure height and size, eldar a slightly taller but skinnier (sounds like an elf to me :) ), ork boys aren't much taller but are much broader, nexcrons (minus the squat) are quite tall and formidable looking, tau seem roughly human sized. Termagants, hormagaunts, rippers and scarabs I have a whole host of issues with (argument for another day), as well as the current battle suit line up. I think you are into something Ron. It' isn't really about "true-scale" as it may be about "proportion". I tried to fix a termie once but it was back when they were all metal and it was a frustrating experience. The conversion wasn't bad but the making was tedious from the material. Now with plastics for every SM, it would make sense just to fix their proportions adding some height here and there, with plasticard spacers or greenstuff. They wouldn't look like they were squatting anymore, which is good also. Doing so, the army still looks coherent and the vehicles don't "shrink" in comparison. I'm just hoping someday GW addresses this and reworks the basic SM sprue, they only need to fix the legs and torsos really. Helmets, shoulderpads, arms, everything else would still work, IF it is just a change of proportion, not a change of scale. If that ever happens, I would buy SMs from GW again. The biggest problem is using guard as a base to figure height and size, to me they are the worst scale miniatures in the entire line. Guard miniatures should be much smaller and thinner for true 28mm, you do that and everything largely falls into place. Still compare an Eldar guardian to a marine then? doesn't make it any better does it? Compare a tau warrior to a marine, a dark eldar warrior, a necron, a sister of battle. To all these the marine is much too small. He should be x2 wider than your average lanky eldar (isn't), a good 1.5-75 higher than a SoB (isn't). I think the issue is, it's their flagship line, alot of the other models that have come out have evolved to a maybe newer 'scale' (look at old DE vs New DE) but due to marines being a staple, and so many armies based on the marines size they have sort of painted them selves into a corner. Could you imagine the uproar that would occur when C:SM gets released next if they changed the scale of your average tactical marine? So I think the issue is people see marines and go "well all this stuff needs to be smaller as marines are the Flagship army and they are 8foot tall supermen", but what really needs to happen (and never ever will, I'd put money on that) is marines currently need to be scrapped (I'll be lenient toward vehicles) and be replaced with a more correct marine size. cool ,I did the same torso lift to make my kitbashed Belail a bit taller and heroic so he would stand out from the rest of the Deathwing. I like the idea of the arm drop also. I've thought the same thing with the Land Raider. I have seen this on the internet a few times, but one way to scale up the Land Raider is to combine the kit with a Baneblade. This link is not my work. Kynikos: Proportion... absolutely. And getting that so it looks correct to you and what you think they should be. TheTrans: you bring up a good point about scaling of marines. Change that and you affect a huge number of folks. SC John: Of the two effects, I think the arm drop has the bigger impact. The whole arms out of the side of the head thing has always nagged at me. Tarvick: There's no way I would want to try that. I'm going as far as converting mine into an older MKII with the tracks on top, but that's it for me. I tap out there. @TheTrans: I actually consider Jes to be the cannon with marines at 7' in power armor. Maybe it's because that's the marines I started playing with. That makes Eldar Guardians, Orks and Necrons the right height. Chests on marines are twice as thick as eldar and the legs are 1.5 times as thick. I'm ignorant of Tau, they didn't exist when I started playing and I've yet to see any models since I resumed. They may be as screwed up as the guard/sisters (whom I consider to have the same general oversized 28mm human problem). If I take any human miniatures from other 28mm lines (those not designed to be knock off IG for 40k) and the marines (and everything else) seem to be the perfect size (7ft). Not to say that other models in general don't fit cannon, I generally don't look to see how tall a specific demon is supposed to be, for example, but I always figured they could very and be any size they wish. And we all know that vehicles/transports/tanks in general in 40k are completely wacko sized. I agree with Daemons due to their nature they shouldn't have a set size shape etc. But saying Marines are correct, everyone else is wrong is a very close minded statement in my opinion. Your saying essentially that one base model (you generalist tac marine that all marines to date are based off in some way) is correct but the 8 other armies that abide by a different scale are all incorrect due the one outdated scale of a tac marine? What if I believe the old RT era marines are cannon size, that would make every single thing out of scale with an out dated model.. Its a bit backward thinking in my opinion. I would have loved to see a picture similar to the last one, but then without the head reference sizes, so your end result is better visible. Two different views would be great. Now the article is kind of 'missing' its end. Maybe you are planning to showcase them painted later on (please do :) Anyways great article! Personally not a fan of truescale, totally agree with your conclusion. Hi Ron, I've been looking at the true-scale TDA you did since your originally posted it trying to figure out what it is about the proportions that is messing with my eyes. You already pointed out the shoulders needs some bulking up, which I agree with (and agree would be a pain to do). But the problem I think is that the powerfist and arm is off. The fist should be closer to a Dreadnought CC weapon and the fist holding the stormbolter should probably be close to the powerfist size...again not easy to do, but at least for me I think this would finish off what you did. Great articles BTW! Anon: I plan on making a terminator using my basic "truescale" method and painting him up completely. Then I'll do a comparison shot of it next to a regular one... without any extra pics. Chris: Thanks! There are so may little things to consider when jumping into a project like this. I never knew so much of a model would be impacted just by changing one little thing. Anon: Thanks for the comment. That link has been shared before and it something folks should review and consider if they do decide to go with them. The purpose of using the model here is for scale purposes only so folks can see what truescaling a model up will do in terms of how it compares to other models. Ron, I'll definitely send you some pics. So far I've been cutting the torsos from their legs which has taken a considerable amount of time. I hadn't cut that much of the metal models before. So far though I've been doing mainly prep work. My green stuff should be in by he 29th - I can't wait for it.